The RF401A is a 900 MHz radio designed for license-free use in several countries, including the United States and Canada. It provides a hassle-free way to create long-distance wireless links between your computer, data loggers, and measurement devices. The RF401A has a 910 to 918 MHz operating-frequency range and a configurable transmit-power output of 5 to 250 mW. Campbell Scientific recommends the RF401A radios for existing installations that require compatibility with products such as the RF401, CR206X, CR211X, AVW206, and AVW211. For new installations, Campbell Scientific recommends using the RF407 or RF451. Note: The image depicts the RF401A with an attached antenna. The antenna is sold separately. Comunicación más rápida debido a la eliminación de algunos pequeños "paquetes de estado de enlace"
Menor consumo del datalogger dado que las radios implementan "filtrado de la dirección del paquete"
The RF401A is a frequency hopping spread spectrum radio designed for 900 MHz license-free ISM band operation. It has a 910 to 918 MHz operating-frequency range and a configurable transmit power output of 5 to 250 mW. It provides one of three selectable active connections including CS I/O, RS-232, and USB. It has a reverse polarity SMA (RPSMA) antenna jack connection. It is over the air compatible with legacy 9XStream products including the RF400, RF401, RF430, CR205, CR206(X), and AVW206. Channel Capacity 7 hop sequences share 25 frequencies. Dimension are from the tip of antenna connector to other side of case, and from the bottom of case to the top of DB9 connector jack screw. The width includes the thickness of the screw heads on the screws that hold the case together. The RF401A is over-the-air compatible with the RF401, RF430, CR206, CR206X, and AVW206. The RF401A is also compatible with the RF400 and CR205, but the communication protocol must be set to transparent. Also, if RF400 and RF401A radios will be in the same RF proximity, do not use 28, 44, 52, 56, or 60 for the RF400 Net Address. RF400 radios with Net Addresses of 28, 44, 52, and 56 interfere with RF401A radios with Net Addresses of 0, 1, 2, and 3, respectively. The RF400 Net Address of 60 interferes with all RF401A Net Addresses. 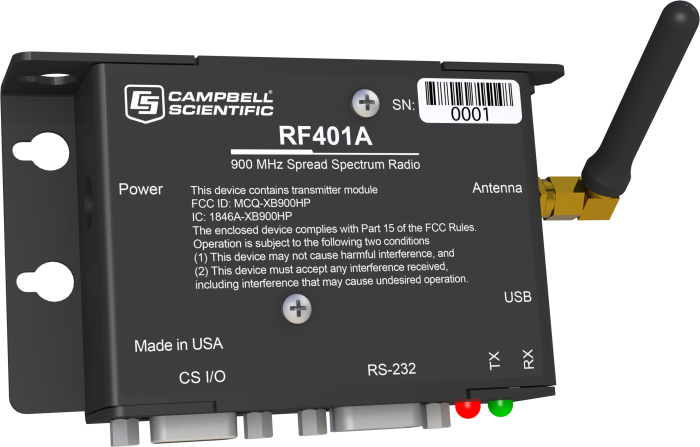 Campbell Scientific does not recommend using the RF401A in networks containing FGR-115 or RF450 radios. Do not mix RF401A radios using the Transparent protocol setting with RF401A, RF401, RF430, CR206(X), or AVW206 devices using a PakBus protocol setting. This will produce RF traffic without any RF communications. However radios with the PakBus Aware and PakBus Node settings can coexist in the same network. *Use a 18663 null modem cable. **It is possible to connect a mixed-array data logger (e.g., CR10, CR10X, CR23X, 21X, CR7) by using an SC932A or SC105 between the data logger's CS I/O port and the RF401A's RS-232 port. If a DOS application requires bidirectional serial wireless communication with a nonintelligent data terminal, will a pair of RF401A radios work? There is a good chance that they would. However, the RF401A radios have been designed to work with Campbell Scientific dataloggers. There are more generic spread-spectrum radios (off the shelf) that are designed to work in this type of configuration. Is there an RF filter for an RF401A or RF450 that can be used to clean up local interference? There are many cavity- and notch-type filters available from third-party manufacturers. How is callback programming done using an RF401A? Use of the callback feature is handled under program control by the datalogger and is not affected by the RF401A. Does initiating RF401A radios require dc power, or is power via the CS I/O connection OK? The RF401A can be powered either from a 12 Vdc source via the field power cable, or from a datalogger via the CS I/O port. Can a COM220 and an RF401A coexist on a CS I/O terminal? The COM220 and the RF401A can coexist on the CS I/O terminal, provided that they are assigned two different SDC addresses. If two RF401A radios are using different operating systems, does that affect their ability to communicate? Does the RF401A have any identified sensitivities to adjacent operating radio equipment? Yes, as do all radios. Adjacent radio equipment operating in the same frequency range can cause interference. How do the RF401A and RF411A compare with their predecessors? The RF401A and RF411A have distinct advantages over their predecessors, including greater maximum transmit power, lower average power consumption, improved packaging, and the inclusion of USB, RS-232, and CS I/O on a single device. The RF401A is compatible with all of its RF400-series radio predecessors, including the RF400, RF401, and RF430. The RF401A is also compatible with the CR205, CR206X, and AVW206. The RF411A is compatible with all of its RF400-series radio predecessors, including the RF410, RF411, and RF431. The RF411A is also compatible with the CR210, CR211X, and AVW211. Is there a limit to the length of antenna cable that can be used with an RF401A? Yes. All antenna cables introduce a loss in the effective output of the system. The longer the antenna cable, the greater the loss. How can an RF401A be used to communicate as both a sender and a receiver with an RF400? For an RF401A to communicate with an RF400, the RF401A must be configured to use the transparent communications option.